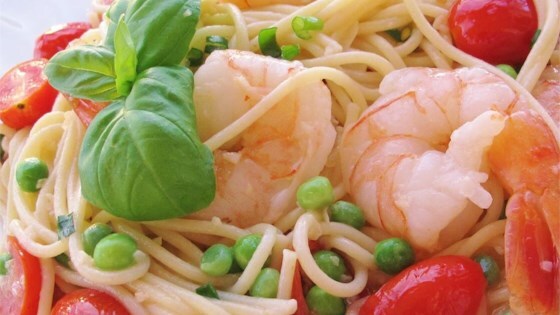 "Quick and easy pasta dish with a little bite that will make anyone look like a gourmet chef. Adjust the chili oil to your own spice level." Fresh and light but teeters on the edge of blandness. Marinate the shrimp first and season the dish well. Just a note, the serving size was printed wrong. This recipe makes 4-6 servings. as is, bland, bland, bland. We ended up rescuing it by putting pesto sauce in with it. Made too much for the 4 of us, reduce by 1/2. Also could use more olive oil and/or chili oil.